Published on April 11, 2011 in jacket and Uncategorized. 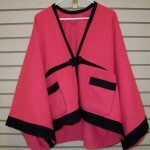 2 Comments Tags: Barb Callahan, dream coat, Sewing and quilting expo. Last month I attended the Original Sewing and Quilting Expo here in Cleveland. Each time I go I swear it gets smaller, but supposedly this was their biggest one yet. 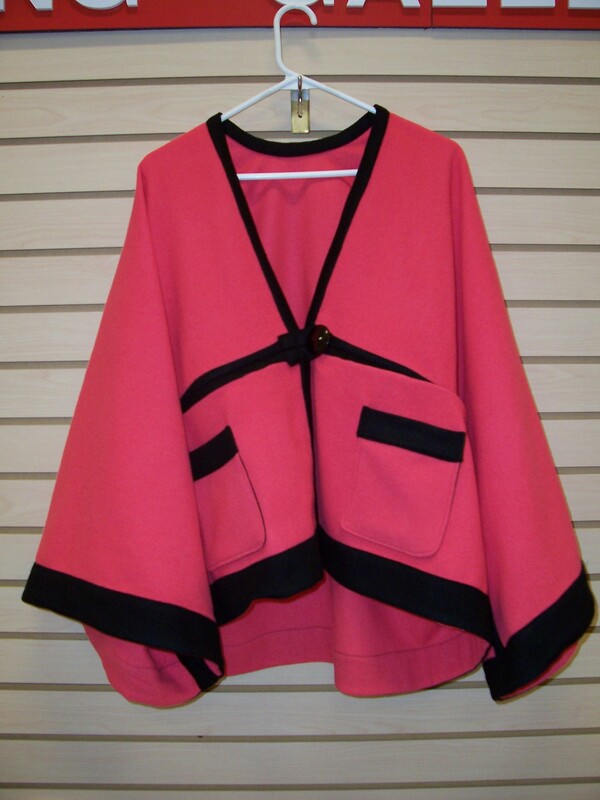 Anyway…..one of the booths that I always stop in to is Barb Originals by Barb Callahan. This year she had her latest creation called Dream Coats. 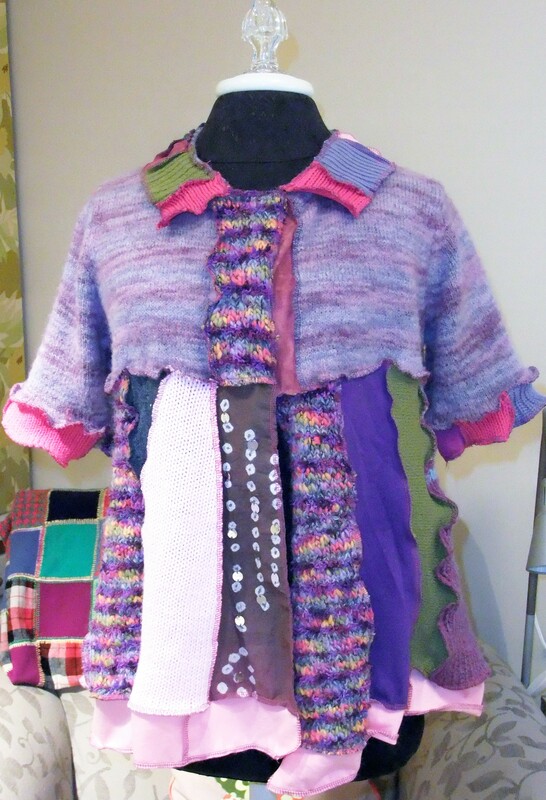 She took various sweaters, t-shirts and other fabrics, then serged them all together to make a fun and unique jacket. I fell in love with the one she had on, just my colors. Luckily, she had some kits made up to sell along with her DVD called Dream Coats. I first watched her DVD on how to cut and assemble the project. Next was a stop at my friend Mae’s house for serger thread. She has a ton of it in a million colors, so it is like shopping in a candy store. 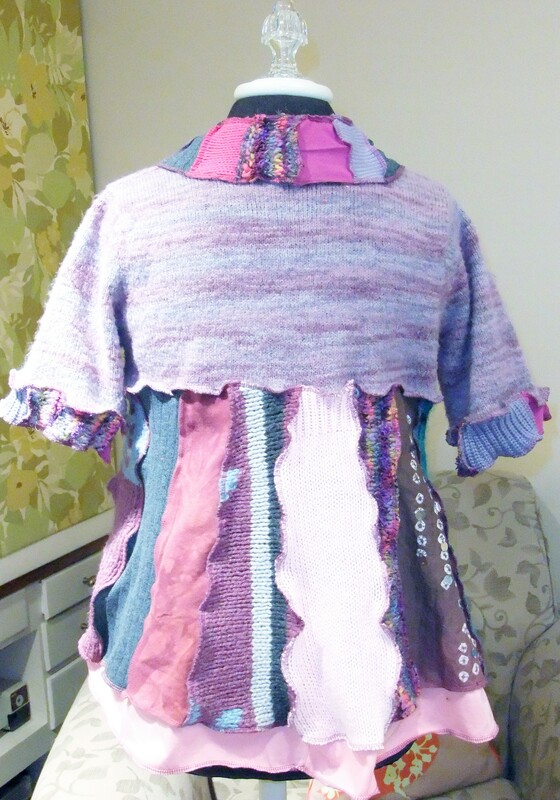 That is one reason she is so amply named the “Serger Queen”. 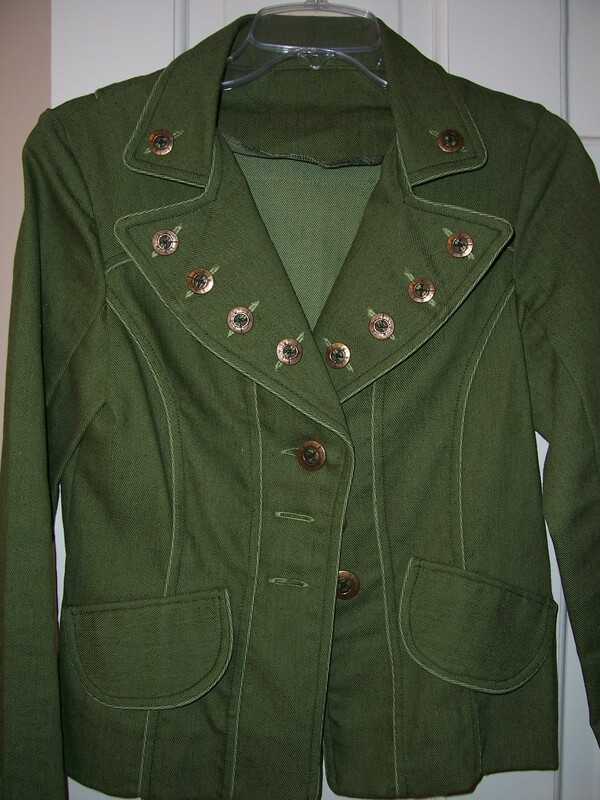 So last Monday, which it was a very rainy day, I set out to make my dream coat. Luckily, all the pieces had been pre-cut and labeled in my kit, so I was ready to go. Wow! How Fun! How Easy! I had it done in now time! My dream coat really is a dream! Thanks Barb! What new things will you have next year? Published on July 5, 2010 in jacket. 0 Comments Tags: Steam-a-seam 2, Stitch Cleveland, Threads magazine. Check out the current issue (#150) of Threads Magazine I have a tip in there for making “fake” buttonholes. I had gotten some fabric at a flea market, which luckily did not fall apart when I washed it. 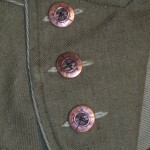 I designed and made a jacket with 15 button holes. 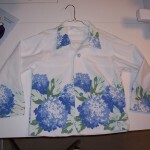 Yes, 15 buttonholes. 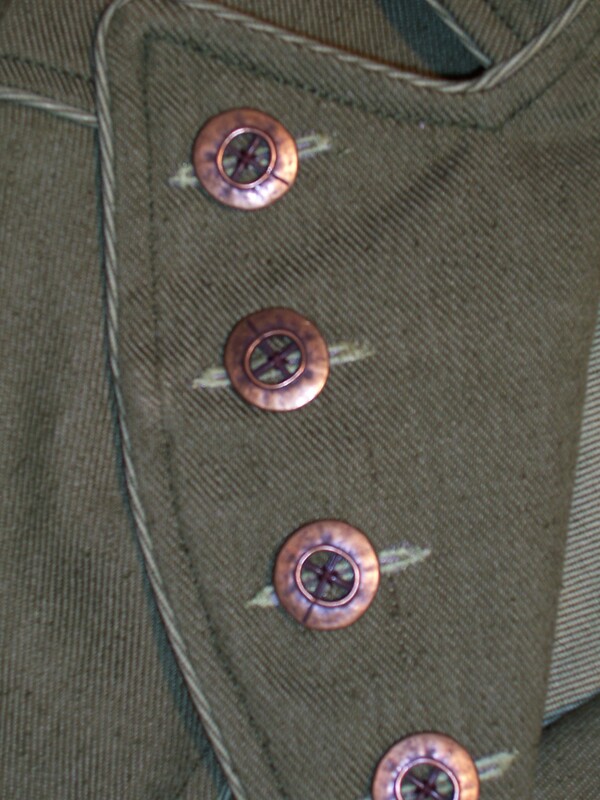 They all were not functional buttonholes, but the buttons are what made the jacket. Anyway, after much frustration of not getting good ends on my buttonholes due to the seam being bulky because of the fabric and the fact that I put piping in the seam too. I had a crazy idea session with my friends Heidi and Megan at Stitch Cleveland and out of that we came up with a solution. I stitched my decorative buttonholes on 2 layers of tulle netting, then I trimmed them close to the stitched, fused them on with Steam-A-Seam 2 and then sewed my button on top. They look real and no one would know except if they looked at the underside and saw no stitching. 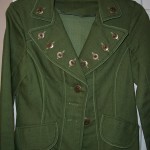 Here’s the completed jacket. What do you think? Published on June 2, 2010 in jacket. 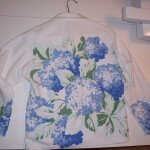 0 Comments Tags: McCall's Quilting, vintage tablecloths. Last time I was telling you about my recent flea market finds – vintage tablecloths. They are so simple, vibrant in color and nothing like tablecloths today. 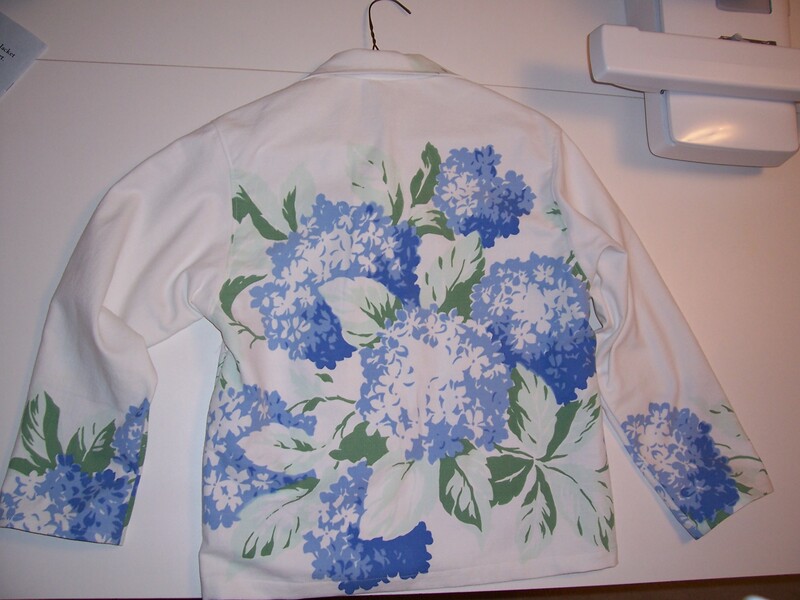 I mentioned that I had made clothing out of them before and here’s the jacket I was telling you about. See how fussy cutting can make the perfect placement of the design. The tablecloth center on the back and the corners on the front. In the latest issue of McCall’s Quilting magazine they took a vintage tablecloth and made it into a quilt. They added an irregular border with matching colors to offset the beautiful center design. Check out the July/August issue. Antique shops, flea markets and online are great places to find tablecloths. Some are very collectible. Be sure to check for stains and holes when purchasing them. Published on February 6, 2010 in jacket. 0 Comments Tags: bog jacket, Threads magazine. I’ve been playing around with some of the projects in the Quick Stuff to Sew magazine from Threads. 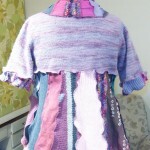 One of the projects is for a Bog Jacket and let me tell you it is so simple. 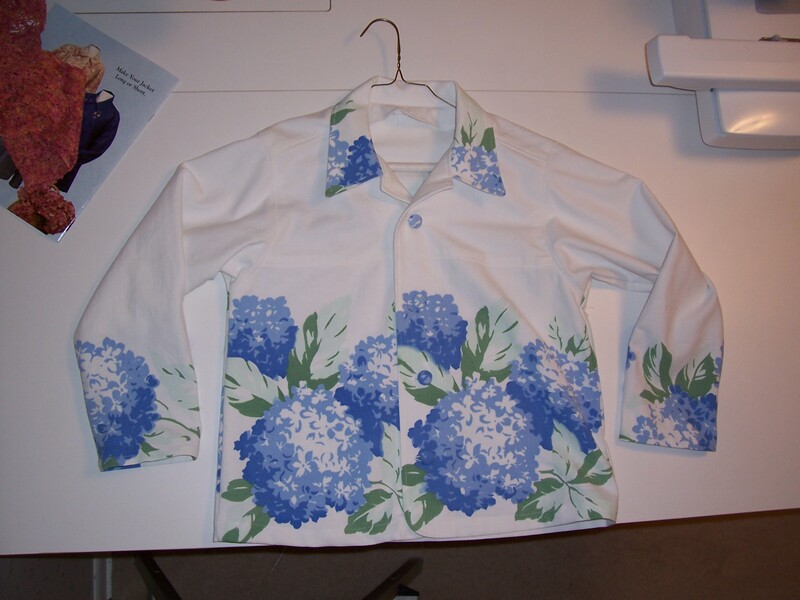 Take one length of fabric, sew two short seams and go from there on embellishments. I loved the one that was in the picture, so I recreated it using some pink wool that I got at Wal-mart. It didn’t have any fabric content on it. I wanted to felt it, but it didn’t so that means it had something else in it too. So used if for this jacket figuring if I goofed it up, no great loss. I’m working on another one and it looks totally different, so you are really the “designer” of how it comes out. I’ll post the other one later this week. It needs something and I haven’t figured out what, so I’m letting it digest a little bit. I’ll be teaching this class at the Viking Sewing Gallery in Mentor. See the class section for more information. Kat McCarty on Getting Crafty!